Wild fennel, gourmet cuisine for Black Swallowtail caterpillars. We had rain... and more rain... and more rain. Between last Sunday and Tuesday morning our rain gauge measured 3.1 inches. Then a few hours of sun, yes, sun and more rain started. Between Tuesday night and Friday morning we had 9 inches. For much of that time the rain came in sideways sheets, blowing from the east and overwhelming the storm drains. The streets were flooded. The preserve behind the house is now filled with water that came up right to the edge of the property, and it doesn't look as if it will drain anytime soon. On Friday it was cooler and cloudy... but no rain. Saturday, the sun finally started shining... no clouds and a bright blue sky! Sunday... more rain. I expect it will be between .5 to 1 inch when it is all over. Then, hopefully at least four or five days of dry weather. The yard people will come back and re-do some of the yard where the seed (put down between the two storms) washed off into the street. And the brick on the front of the house will dry so the roofer can come and re-caulk a couple of windows and put a sealer on the brick. Ah, yes! We had a leak in the dining room and master bath. The roofer said he had had calls all day Friday... things leaked that had not done so in 15 years. I think the combination of the very, very hot summer and the rain was just too much for the caulking and the brick. It is always something! But at least there should be more blue skies on the way with a bit cooler weather. Time to clean up the flowerbeds and plan for next year. There will definitely be more of this out near the preserve next summer. Fennel, the preferred meal for discriminating black swallowtail caterpillars is gone now. At the height of summer, the botanical garden had large massed plantings with flower stems that grew to over 6' tall. The swallowtail caterpillar loves this plant along with parsley, carrot tops and Queen Anne's Lace which is also in the carrot family. Fennel is easy to grow and all parts of the plant are edible (for humans), including the root. There are other plants that do not grow well with fennel around, particularly rosemary, so let the rosemary grow elsewhere. 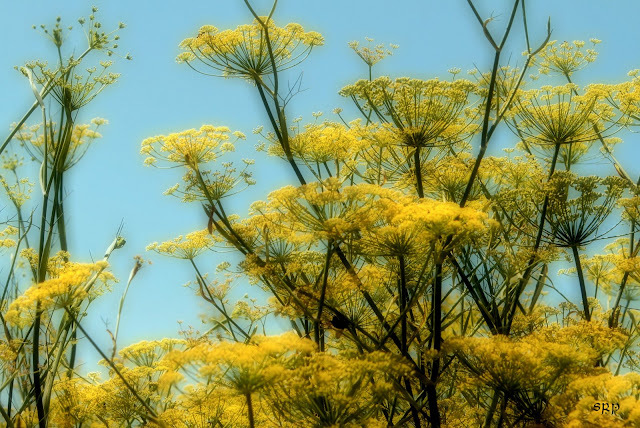 These fennel flowers are long gone... but they can still brighten a cloudy and rainy day with their little rays of sunshine.... in my pictures. So, have a bright and sunny, mellow yellow Monday! Sometimes I would order Queen Anne's Lace for a wedding and I would get this instead. It's pretty, but not the right thing when you need white!! Glad the rain is over for now. We lost one tree due to it. Wow, you really had some rain. I'm sure David probably got water in his basement. I had something like that happen last year to my roof when there was lots and lots of rain. There wasn't actually a leak, but the ceiling in my garage got wet from some backup or water or something. I hope yours is soon fixed. I'm finally feeling sort of nrmal after my trip back from California. I had such a wonderful time out there...came home with many good memories. Such beautiful shot you have. Love it! The same thing has been happening here. We got about 6 inches in a 24 hour period. People's basements have flooded that never did. Your words and your wet days brings to mind, "When it rains, it pours." Sending wishes for sunfilled drying days. This Post Is Brought To You By The Letter "O"
Can You Feel The Rhythm Of This Heartbeat?